It has come to my attention that the Oakwood Restoration Committee, who are primarily made up by the Virginia DEC/SCV members, have met with the city of Richmond ask them to PREVENT the SCV camp Fire eaters from doing any kind of work in Oakwood Cemetery . No trash removal, trimming, cleaning, resetting or placing of markers. We are very confused at this point why our own SCV leaders/and members being Mike Pullen (757-538-8717), Tracy Clary (434-774-4341) Lee Hart (757-472-3498) Bragg Bowling (804-389-36520) would prevent their OWN members from doing their duty and following the charge! Are you made yet? Why would our own national leaders know what is going on with the corruption here in Virginia and continue to allow stuff like this to happen? Want to voice your opinion? Please do so respectfully! Please call or text the numbers listed and ask WHY they would prevent a SCV Camp from cleaning up a Confederate cemetery and following the charge. Call or text our CIC National and ask him to step in and stop this immediately. 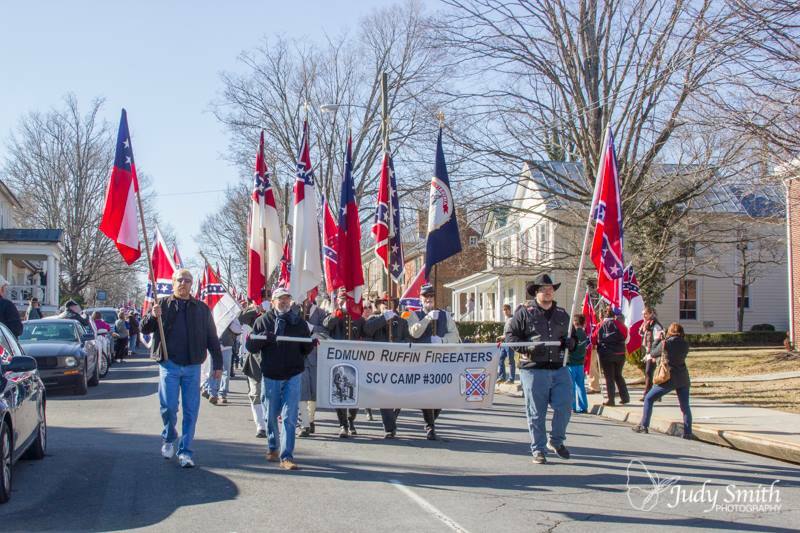 I thought I had seen everything but I am at my wits ends and something has to change immediately or we have certainly failed our Confederate ancestors here in Virginia. Compatriot Jim Tingle presented a wreath, on behalf of the Edmund Ruffin Fire Eaters, at the Lee-Jackson Day service in Lexington, VA.
We are pleased to announce that Karen Cooper is the new editor of our camp newsletter. Please support her by sending reports, quotes, event dates and any information pertinent to our Camp or organizations we support. All submissions will be considered and possibly edited to accommodate format and included as space allows. The Edmund Ruffin Fire Eaters are rescheduling tomorrow’s Oakwood Cemetery clean up day in anticipation of muddy conditions and inclement weather. The weather forecasters are calling for heavy rain and mixed precipitation overnight into tomorrow morning, which will make already muddy conditions worse. The new cleanup date is February 7th. We will have people at Oakwood at 8am to get things started.Those participating in the Adopt A Highway project on the 7th will meet the others at the Cemetery at approximately 10am. For all of you that are planning on attending the Oakwood Cleanup on Saturday, 1/24/15 Please stay tuned. We will be evaluating the weather forecast for Saturday and make a decision on the event by end of day on Friday. 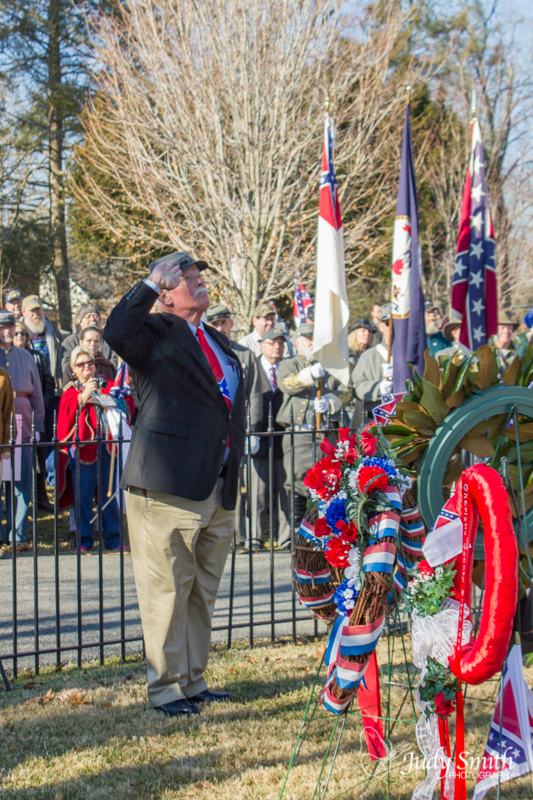 Thank you all of our compatriot that came out to the Lee-Jackson Day events in Lexington this weekend. Y’all sure did look sharp marching in the parade!! 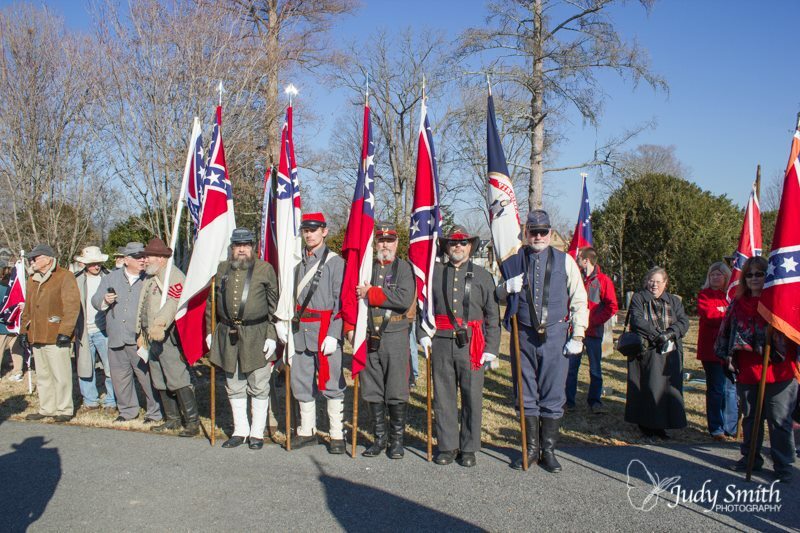 Our color guard at the Lee-Jackson Day service on Saturday at Stonewall Jackson Cemetery. More photos from the weekend can be found at Judy Smith Photography. Certificate of Appreciation presented to the Edmund Ruffin Fire Eaters Camp 3000 from Ronald Lee Perdue, Chairman Mattie Clyburn Rice Memorial Dedication. 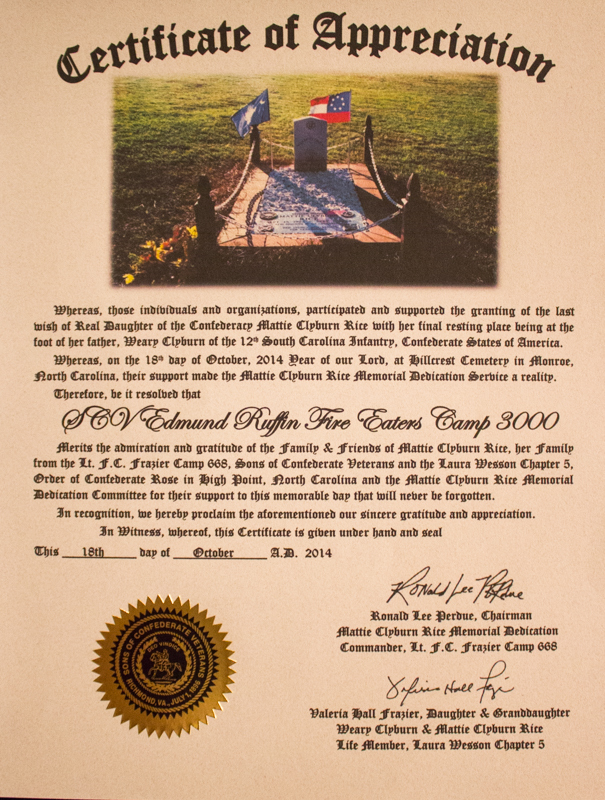 Certificate of Appreciation to the Edmund Ruffin Fire Eaters Camp 3000 from Ronald Lee Perdue, Chairman Mattie Clyburn Rice Memorial Dedication. 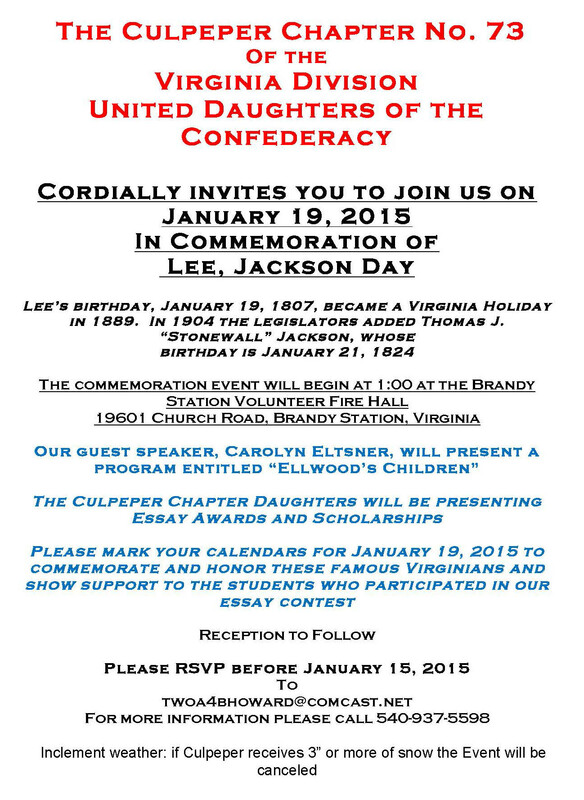 The Edmund Ruffin Color Guard has been asked to present the Colors for the Culpeper Chapter UDC Lee-Jackson Ceremony at Brandy Station. We will be posting the Colors at the beginning of the Ceremony and then retrieve the Colors at the end of the ceremony. I will be arriving about noon to help set up tables and chairs for the event. All help in this is welcome. Please let me know if you can attend. I have attached their flyer with more details and the address of the event. 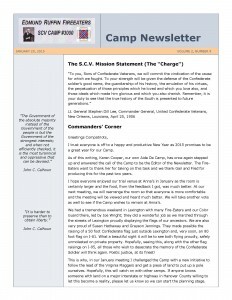 Calling All Compatriots! The camp will be doing clean up at Oakwood Cemetery on January 24th, 2015 from 8:00 am to 3:00 pm.